Manufacturers usually build metal workbenches using stainless steel because of its strength and anti-corrosive properties. The stainless steel creates a rigid frame and gives the workbench a finished look. Steel workbenches are also very easy to clean if the bench is being used in a setting where cleanliness is important. A metal workbench can be used for many purposes; so many different designs exist to help with various functions. Some metal workbenches have foldable legs so that they can be easily stored away when they are not being used. Others are fitted with small wheels to make them mobile. Manufacturing of metal workbenches typically starts in metal fabrication plant where the metal sheets are cut down to size and shaped into the components of the workbench. Once the pieces have been molded into the right form, they are welded together by hand or using an automated welding machine. Automated welding machines are the most common for this step since they are faster and more precise, allowing for top quality welds and higher levels of production. Precise welding of all the joints on the metal frame is important for maintaining strength, especially if the workbench is used to hold heavy objects. A metal workbench can be very simple, but it is usually fitted with a few accessories to make any job more convenient. Shelving, cabinet doors, and drawers can all be built into the frame for storage and quick access to tools when the workbench is being used. Locks can be fitted to these drawers to secure valuables. Sometimes overhead lights or extra electrical outlets are integrated into the design of a metal workbench to make things more visible and make it very easy to connect power tools to an electrical outlet. 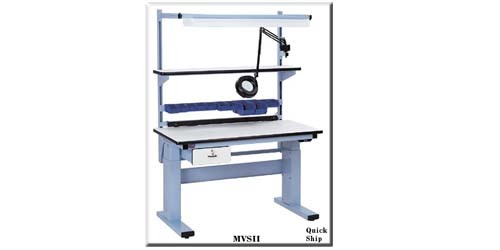 Most metal workbench manufacturers design and create a wide variety of metal workbench products that start with the most basic type and move all the way up to a workbench that is loaded with extra accessories. Each industry has specific needs, so what functions well in one business might not be enough in another. Workplaces like carpentry shops, auto repair facilities, welding plants and metal fabrication shops all have very different needs, so various metal workbenches are available to meet those needs. 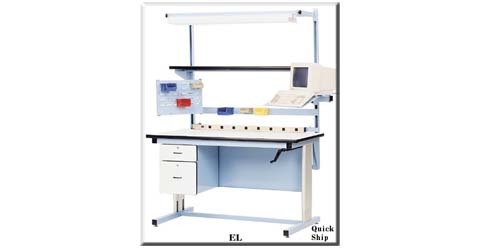 Metal Workbench Metal workbenches are usually found in industrial or commercial settings where a multi-purpose space for working on projects is needed.